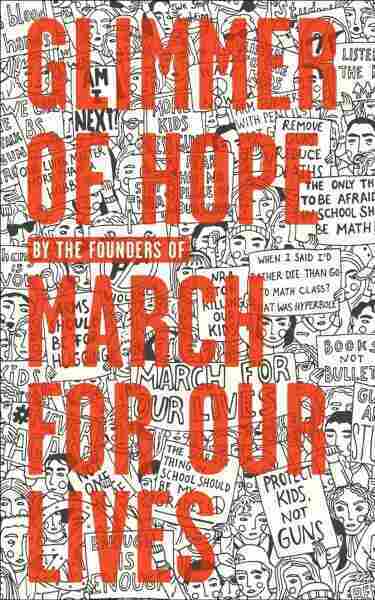 'Glimmer Of Hope' Provides A Blueprint For Launching Social Change With a new collection of essays, the 25 founders of March For Our Lives return the subject of the Parkland shooting and gun violence to national consciousness just in time for midterms elections. Mass movements are rarely set into motion by the work of just one or two individuals. Instead, they generally rely on the skills and efforts of many. While one or two faces often serve as the group's mouthpiece — faces at which both admiration and condemnation are directed — behind them are many more who are equally responsible for inciting and sustaining the cause. In the case of March For Our Lives — a gun violence prevention movement born out of a mass shooting in Feb. 2018 at Marjory Stoneman Douglas High School in Parkland, Fla. — arguably the most easily recognizable faces and names are those of David Hogg and Emma González. But behind March For Our Lives, one of the largest youth-led movements in recent history, are many other names and faces. And in their new book Glimmer of Hope: How Tragedy Sparked a Movement, 25 individuals, identified by name as well as collectively as the "founders of March For Our Lives," share a detailed account of the effort required to launch a mass movement. Parkland was the site of one of the worst mass shootings in American history, claiming the lives of 17 students and teachers and injuring 17 more. Almost immediately after, a group of students emerged who were focused on channeling the intense emotions they experienced in the aftermath into a rallying cry for social and political change. The book, which consists of individual and group essays, excerpts from speeches delivered at rallies and marches in the months that followed, the content of social media posts on Facebook and Twitter, and conversational dialogue provides a chronological account across a variety of perspectives. It includes writings about related aspects from the moments of confusion and terror on the day of the shooting, to the students' return to school two weeks later, to the march in Washington D.C. Along with their words are photos: some from professional services and wires — but many taken with cell phones, including group selfies. This collection also serves as a practical guide on how to launch a movement in the digital age. The students outline the approach they took to build a social media presence, channel attention from news outlets, raise funds, connect with elected officials, design merchandise, and lobby for gun control legislation. While many have argued that adolescents belonging to Generation Z have been negatively influenced by their digital upbringing, the success of March For Our Lives — in terms of building a movement and engaging others — is an example of tech-savvy teenagers who have effectively wielded what they have alluded to as their socioeconomic privilege, platform, and social media power. The timing of the book's release may help to return the subject of the Parkland shooting to national consciousness just in time for midterms elections, encouraging voters to elect officials who will fulfill some of the Parkland survivors' asks. (These asks, of which there are 10, are clearly listed at the end of the book.) It follows up on the June release of #NeverAgain: A New Generation Draws the Line, by siblings and shooting survivors David and Lauren Hogg, which acts as both a memoir and a manifesto. There are moments reading Glimmer when you may forget that the leaders of March For Our Lives are kids. Some of the book's authors are still too young to vote. But this book will also help you remember. They succumb to clichés in their writing. At time their prose is redundant. But in their short lives, they have not only survived a mass shooting, they have also channeled their emotions into coherent writing. They are now published authors. The most powerful chapter of the book comes in the form of a transcript-like aggregation of conversational stanzas from 15 of the book's authors concerning their first day back at school on Feb. 28. It opens with a line from Adam Alhanti: "There's no handbook for rebuilding after a school shooting. No one knew what to do." And that is exactly what the chapter conveys, the messy myriad of reactions and responses from students and the inability of the school district's actions to please everyone. It is in this chapter that the students also take the time to mention the reactions of their teachers, a perspective that has been under-discussed. Their comments are observational and pensive. They notice the unexpected moments of quiet. They toe the discarded Valentines that still litter the floor. Some students are comforted by the police officers in the halls cradling handguns. Others are horrified. Still others are fuming. Some feel protected. Others patronized. For some, the soft return to school complete with therapy dogs, Play-Doh, and coloring is appreciated. Others can't stop worrying about their grades. There is no one way to respond to tragedy. There is no one way to be a teenager. In allowing more than a dozen students to challenge one another, forming the structure of the book (they at times contradict themselves, sandwiching their comments one after another), the collection attempts to uncover the incredible complexity of addressing a community where each individual grieves differently. While the book is meant to follow the founders of a movement in the days, weeks, and months after an event that has permanently altered their lives, it draws attention to the voices that still need to be heard. After reading these stories, despite their diversity, they are still limited. The voices are almost exclusively older students, many of which have now graduated. What is life like at Parkland today for the students and teachers who remain? A lot has changed in the eight months since the Parkland shooting. Just last week, This American Life reported on how life has changed at Marjorie Stoneman Douglas. According to producer Robyn Semien, who spoke to teachers and students still at the school this Fall, there are new gates, new fences, and new cameras installed on campus. Students must submit to gym bag searches. Staff members use key cards to enter buildings. Trauma kits are stocked in every room. There are 15 campus monitors when last year there were only five. Marjory Stoneman Douglas is doing its best to move on. But Glimmer shows that many of their students are consciously choosing not to. They are deferring plans for the future, many have decided to take a gap year or two before starting college, in order to stay in the present. Yet at the same time, their work is focused on the future — aiming to ensuring that Parkland is the last mass school shooting in their lifetimes. It's fitting, then, that 100 percent of the authors' proceeds from the essay collection, as well as a percentage of Penguin Random House profits, are set to be donated to the March for Our Lives Fund. Aubri Juhasz is an intern for All Things Considered. She graduated from Barnard College in May.